It is a startling experience to come upon Wedgwood Rock for the first time. More than 19 feet high, the Rock looms up out of a parking strip on 28th Ave NE at the intersection of NE 72nd Street. 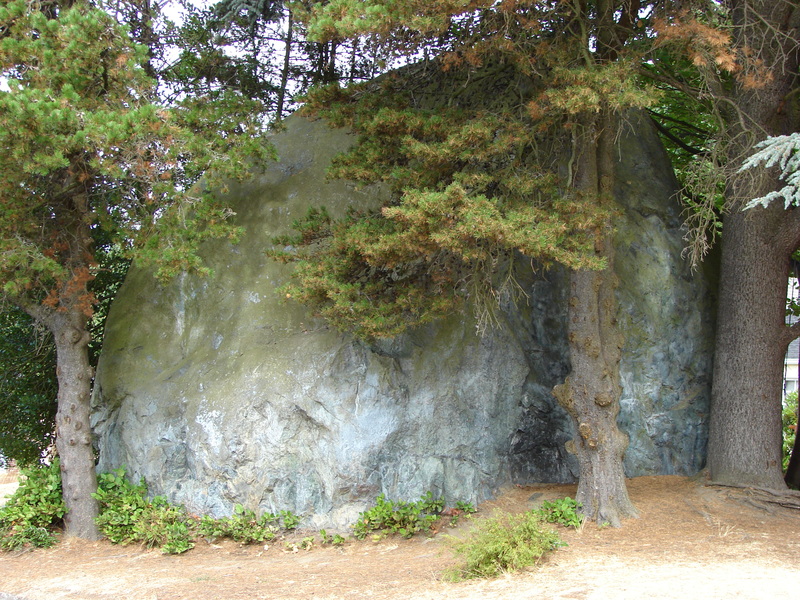 Wedgwood Rock is located at 7200 28th Ave NE in Seattle. Photo by Valarie. How did the Rock get there? Certainly it was not put in place by Albert Balch, the developer who platted the surrounding streets and built the houses! Research on Wedgwood Rock has been done by Dr. Terry W. Swanson, Department of Geological Sciences and Quaternary Research Center at the University of Washington in Seattle. The term “quaternary” refers to the time period of the most recent Ice Age, when glacial ice extended down into Washington State as far south as Olympia and Spokane. This glacial movement is called the Cordilleran Ice Sheet, from a Spanish word meaning cord or string of parallel mountains. The geography of the Puget Sound region has a north-south orientation as though long fingers reached out and pressed down into the earth. The “dough” of the land oozed up between the glacial “fingers” to form mountain ranges, and the depressed areas became Puget Sound, lakes and lowlands. “How’s This For a Rockin’ House?”, Washington Secretary of State blog, June 2015. Washington’s Glacial Geology,” Washington State Department of Natural Resources. This property card from the tax assessors office is meant to show the house at 7200 28th Ave NE, but of course we are more impressed with the view of the Rock in 1948. Photo courtesy of the Puget Sound Regional Archives, repository of the property records of King County. This entry was posted in Wedgwood Rock and tagged geology, glaciers, Neighborhood History, Seattle. Bookmark the permalink. Pingback: From Our Corner » Blog Archive » How’s this for a rockin’ house?